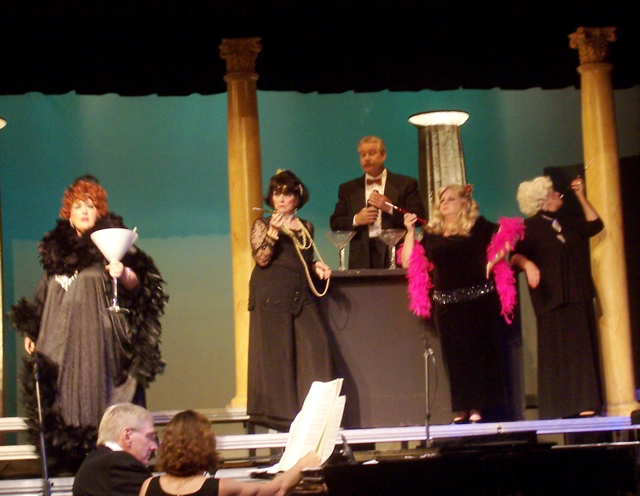 Idyllwild Master Chorale’s “Cole,” a wildly entertaining tribute to musician and lyricist Cole Porter, featured 28 of his songs in two acts, with interesting narratives, Broadway songs, short dance numbers, glitzy costumes and bawdy humor. 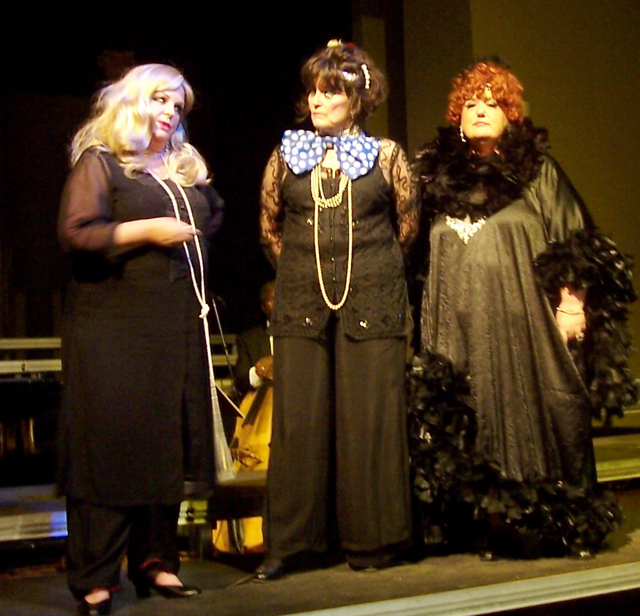 Locals who went to see the show on Saturday night, July 24, laughed, sang along and gave the troupe standing ovation. “This show was a lot of fun,” said Rosemary Barnhardt, who came early with her husband, Ken. 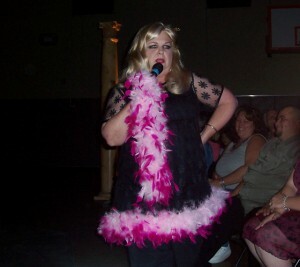 She is a friend of Phyllis Brown, one of the cast members. 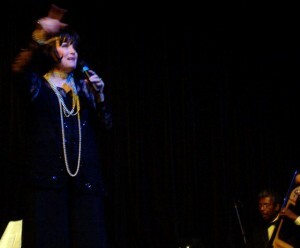 “Phyllis told us to sit in the front row, because she’d might sit on Ken’s lap during one of her solos,” Rosemary said with a giggle. Phyllis Brown camped it up for her Cole solo, "The Laziest Girl in Town"
As it turned out, Ken had his legs crossed during Phyllis’ rendition of “The Laziest Girl in Town,” so she just flirted with him and laced her feather boa around his neck. Besides Phyllis, the other cast members included: Scott Fisher, Lisa Furugen, Bella Gioeli, Justin Patrick Holmes, Dwight “Buzz” Holmes, Larry Kawano, Steve Kunkle, Linda Lackey, Lori Palmer, Barbara Rayliss, Jay Rubin and Mike Sebastian. Interestingly enough, those 28 songs were created with only two instruments a grand piano and a bass. Ed Hansen played the piano and Marshall Hawkins, from the Jazz Department at Idyllwild Arts, was on bass. Dressed in a black sequin dress, Lori Palmer sings her heart out in "What is this Thing Called Love?" The staging was minimal, reminiscent of the Broadway productions, with Egyptian columns, and black tiered steps that you could dance on. The back stage was used for the larger group numbers, while the front stage, close to the audience, was used for shorter numbers. More than likely, the shorter song-and-dance numbers were a distraction while the cast changed clothes for the next number. Act One featured 16 songs from Cole Porter’s early life, including his time at Harvard and Yale. “He was editor of the school magazine at Yale, and could have gone into lumbering, farming or mining, but he went into Harvard Law School,” said Larry Kawano, who was acting as one of the narrators. However, Cole, who was named after his wealthy grandfather, graduated from Harvard’s Music Department instead. Cole wrote more than 300 songs at Yale, including “Bingo Eli Yale” and “When the Summer Moon Comes ‘Long,” from 1902 that were sung early that night. When they sang “Lost Liberty Blues,” from Des Ambassadeurs in 1928, the pianist, Barbara Rayliss, in a Doris Day wig, was also sporting a foam green Liberty crown, along with the four guys who sported black robes, the foam crowns and torch flashlights. Lisa Furugen, who also co-directed the show, did a hilarious rendition of “Mrs. Lowborough, Goodbye” from 1934. Wearing a red curly wig and dressed in a black sheath dress with lots of feathers, Lisa delighted the crowd when she drank from an oversized martini glass. Her voice started clear, then got increasingly more slurred as she imbibed more gin. Her “gulping” sound effects made the crowd giggle and cheer. 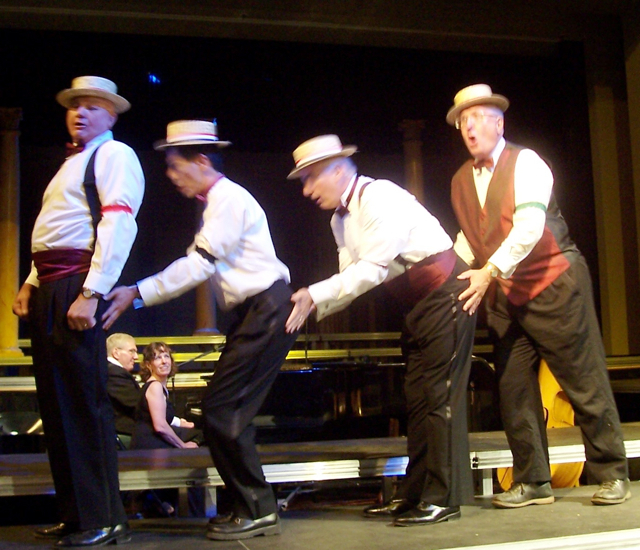 “I’m a Gigolo,” from Cole’s 1934 “Wake Up and Dream,” was made popular in its day for its clever lyrics, such as “I’m pushing ladies with lifted faces around the dance floor.” However, Mike Sebastian took it to another level with his tap dancing. He started from the top tier and danced his way down the steps to the front stage. The audience broke out in spontaneous applause. Lisa Furugen and Steve Kunkle gave a memorable “I Get a Kick out of You,” from “Anything Goes.” Lovebirds Lisa and Steve, looked deeply into each other’s eyes, as they danced and sang. “Hollywood is like living on the moon,” said Larry of Cole. “In 1940, when screen legend Greta Garbo asked Cole Porter if he was happy, he said, ‘yes,’” Larry said. “’That must be so strange,’” was her reply. “But, by the time he attempted to perform Shakespeare’s “Taming of the Shrew” on Broadway, the Cole Porter era was over,” Larry said. 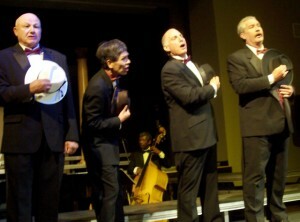 In a barbershop style harmony, Larry, Steve and two others sang, “Brush up Your Shakespeare,” that delighted the crowd. Instead of backstage, they exited down the front aisle, and hurried back to finish the last number, “Every Time We Say Goodbye,” from 1944, that included the entire cast. By the time it was over, the audience of about 50 people, were on their feet. 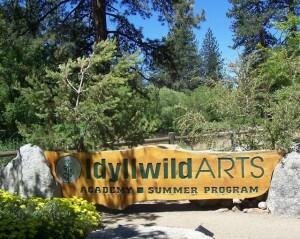 At Idyllwild Arts, some people are taking one, two, and three art classes, and practically spending their entire summer here. But they wouldn’t have it any other way. Annie Gutierrez, a retiree from El Centro, and Kim Christensen, a teacher from Highland, have already taken three classes so far, and may sign up for more. Back in Highland, Kim belongs to a group that makes rocks into jewelry.Yet, they were limited in their tools. When Kim brought back a few tools that she created at Idyllwild Arts, her friends were impressed. She showed off her bracelet that she made in her “Navajo Inlay” class. It was silver, and about 1/2 inch thick, with square turquoise and blue stones on one side, and two ancient animal shapes on the other. Richard Tsosie, a Navajo jeweler and sculptor from Flagstaff, who taught the class, would show them how to do something, but they’d have to finish the piece on their own, Kim said. She’s also enjoying “Soldering Boot Camp,” in which they use tools with a flame to connect pieces of jewelry together. According to the brochure, the purpose of the course is not to complete one piece, but to become proficient in soldering. So far, she as taken “Folding Clay Slabs,” and “Mosiacs 101 & Portraits,” and is currently enrolled in “Creative Nonfiction.” But after a class she took last year, she experienced censorship. She took the class from Cynthia Constantino called, “Figurative Sculpture,” in which they worked from a live model to create ceramic sculptures. Afterwards, Annie entered her sculpture in the Imperial County Fair and won first prize. After much discussion between the judges, they told her that she could keep the blue ribbon and the $30 prize money, but she’d have to take her sculpture home right away. “Folding Clay Slabs,” was one of the first classes that Annie took this summer, and the most enjoyable so far. It was a six-day class taught by Mary Kay Botkins, from East Dundee, IL, who exhibits her folded clay pieces nationally. She taught Annie and the rest of the class to roll their clay super thin, about 1/8 of an inch thick, by compressing it. “That was probably the hardest thing to learn how to do, but when the clay is compressed, it’s pretty strong,” Annie said. Then, she’d watch Mary Kay create a container, by making a couple of pleats, or adding a waistband, or even a belt loop. “When she was working, you’d swear that she was working with leather instead of clay,” Annie said. The students in the class were also expected to be prolific, Annie said, because Mary Kay wanted them to take home a “set” that they could use as a reference. Within six days, Annie created a cup, a vase, a tray and a container. “It’s something I’ve never seen before,” she said. Like hundreds of others before me, I was worried about the horse standing in the hot sun. Did he have enough water? And there was no shade trees around him, next to Hwy. 243. It must’ve been 90 degrees out there. I must help him! So I ran home, got a bucket of water, and some carrots from the fridge, and drove back. I shimmied under the barbed wire fence, and gave him the bucket. Next to his massive head, it looked like a little Dixie cup. He immediately picked it up and dumped out the water! I gave him a few carrots, and was searching for a hose to fill the bucket again, when the owner walked up. “Can I help you?” she asked. 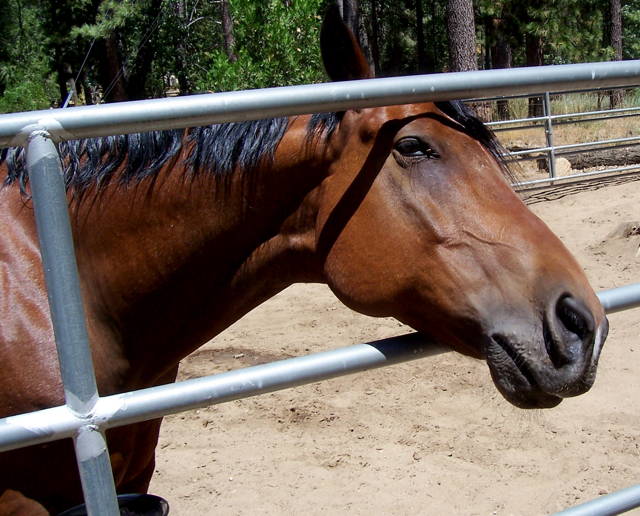 Which is very polite for someone messing with their horse on their property. The barbed wire fence should have been a clue. “Oh, I was just trying to get some water for your horse,” I stammered. As it turns out, I am not alone in my concern for “Sherman,” the quarter horse. In any given weekend, at least three people will come up and ask about the horse. Their main concerns are: There is no shade and no water for the horse. 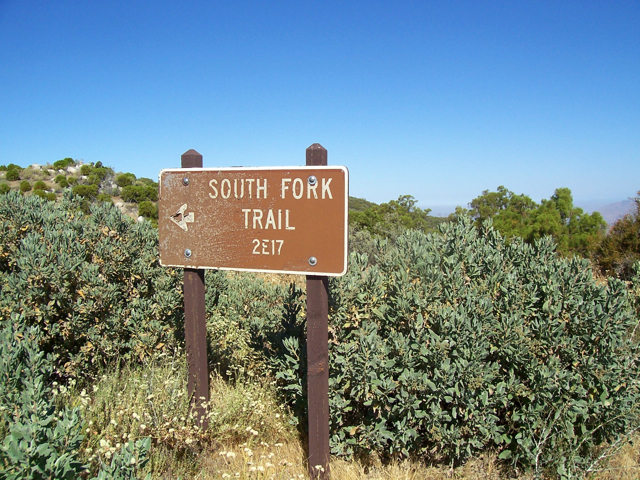 “When we lost that oak tree two years ago, then more people began stopping by, concerned,” Joyce said. At least three of them have reported the Millers to Riverside County Animal Control. 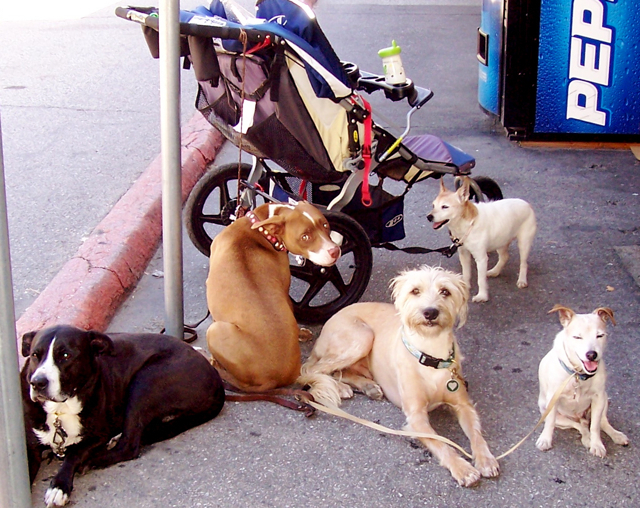 “They have to come all the way from Riverside to see that Sherman is OK,” Joyce said. She’s gone through two inspections, and one time they left a note of approval. First, they inspect the horse to make sure he’s not dehydrated or malnourished. Then they check to see if the area and stables are clean, and free of sharp objects. Each time, the Millers and Sherman got a clean bill of slate. 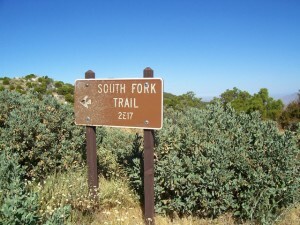 "People became concerned about Sherman when the oak tree (at L) died two years ago," Joyce said. 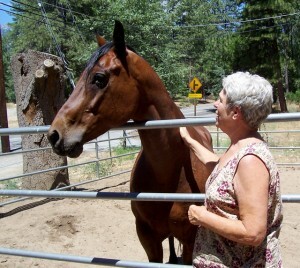 Joyce said that horses like the sunshine because it generates a lot of vitamin D, which is healthy for their bones. Sherman is 12 years old, and they’ve had him for seven years. “When he’s at home in Orange County, there are trees on either end, and he still prefers standing out in the sunshine,” Bill Miller said. 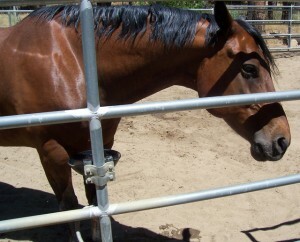 Another roping horse of Bill’s was 32 years old when they finally had to put him down because of a disease. “Our horses live a long time because we take care of them,” he said. Sherman is obviously well taken care of. In fact, he has a little bit of a gut. During our visit, he urinated once (for a long time), which is not an indication of a dehydrated animal. There were no piles of manure anywhere, and the ground was raked clean. Nearby trash cans were rinsed and turned upside down. 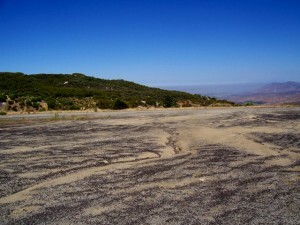 It was a pristine place. But, most importantly, Sherman’s water fountain was full and he had an unlimited supply of water. However, if you looked closely, there were a few flies buzzing around his eyes and knees. Yet, whenever Joyce puts a hood on Sherman, she gets criticized for that too. Joyce explained that the hood, which keeps the flies away, is like looking through a screen door. Sherman started playing with the bucket that I brought, flipping it around like a toy. When Joyce stood next to him, he’d nuzzle her. Twice a day, Sherman gets fed alfalfa cubes. They’re an easier way to feed horses with less waste, Joyce said. 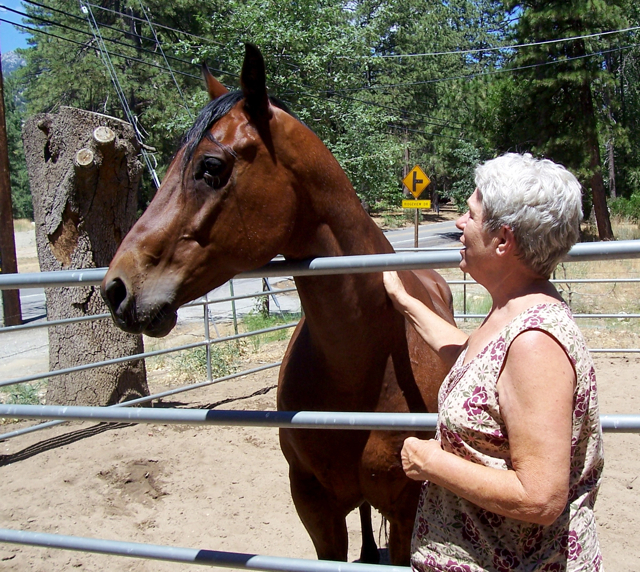 Visitors and locals like to feed Sherman apples and carrots, which Joyce doesn’t mind. However, Bill would rather no one feed the horse, and stay on the other side of the fence. 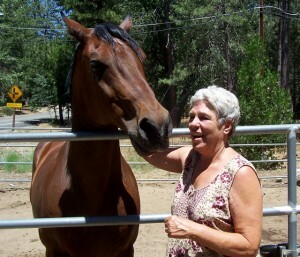 Joyce said that when horses get sick, they roll on the ground, trying to alleviate their discomfort. Sometimes, however, the rolling can disturb their organs, and they could die However, Sherman has never gotten sick from anything people have given him. And he’s eaten some pretty strange stuff. Most people give Sherman apples and carrots. One guy tried to feed him a dusty miller, but he didn’t like it, Joyce said. One horse of Bill’s loved carrots, but hated apples. “They used to give him medicine disguised in apples, so he grew not to like them,” Bill said. Bill and Joyce Miller live on the same property (about 20 yards from Sherman) in a quaint cabin with lots of windows. Joyce’s parents built the cabin in 1923, and they’ve been living here during the summers since 1952. They’ll bring Sherman back to OC in September. “Just tell people that Sherman is doing just fine,” Joyce said. In the cover of darkness, the four of them unloaded it from the truck. 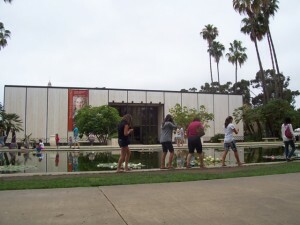 The sculpture was over six feet tall, weighed 250 pounds, and was awkward to maneuver to the ground. All of this was for the love of public art. 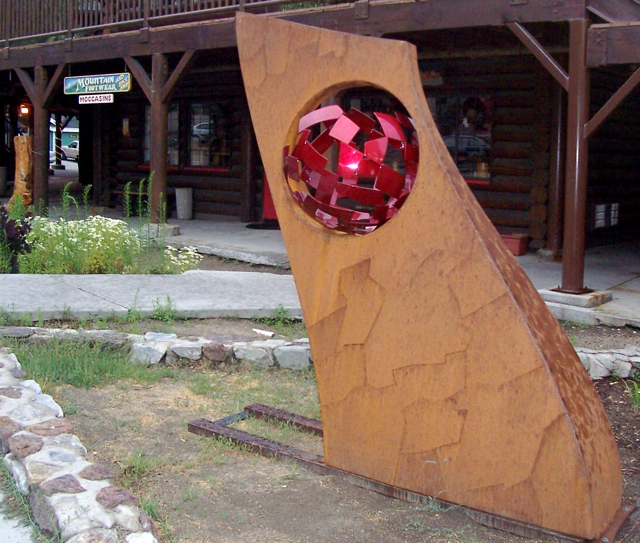 At 8:30 p.m. on Wednesday night, July 14, Idyllwild received another public art piece by Dore Capitani, a metal sculptor from Dore’s Mountain Metals, in Mountain Center. This sculpture was the second of a series of public art sculptures promised to the people of Idyllwild by the Chamber of Commerce. 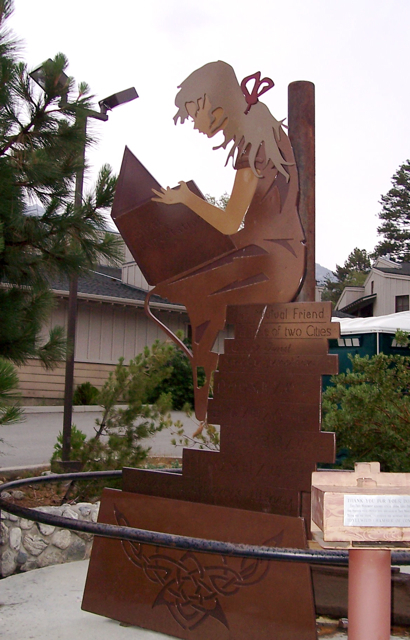 The first one, depicting a young girl reading a book, is placed at the site of the former tree monument. It was also created by Capitani. Moulton and Capitani met because they’re both Chamber members. The new sculpture sits in front of Mountain Footwear in the Fort on North Circle Drive. 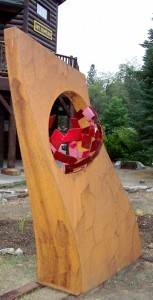 Richard, who owns it, agreed to host the sculpture on his property. “Richard was supposed to be here too, but he forgot,” Moulton quipped. The new sculpture depicts one of Capitani’s “signature” spheres suspended in the middle of a large, rusted metal shape that slants a little to the left. The sphere is powder-coated vibrant red (a new technique). But the sphere is not complete, and that’s what concerns Moulton. He thinks that the half sphere will be an “invitation” for kids to hang on it, and perhaps break it. Capitani, who’d like to sell the piece he calls, “P1” is also concerned about vandalism. More than likely, it will be used as another “photo op” for visitors to Idyllwild. 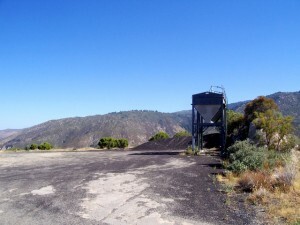 At the sculpture site, there isn’t any description of “P1” or information about the artist, although it’s signed “Dore” at the bottom, if you look for it. Some familiar faces are seen on the Idyllwild Arts campus this week. They’re not former teachers or alumni, but regular Idyllwild Arts Academy students who are taking summer classes. They’re bored watching TV at home, or just want to hone in on some dance, acting, or music skills, before classes resume in the fall. As a theater student last year, Jacob became enamored with costumes. So much that he now wants to switch majors and focus on the Costume Shop, instead of acting onstage. For the “Student Choreography” dance sessions held at the end of the year, Jacob helped out Ariann, a dance student, with her costumes. 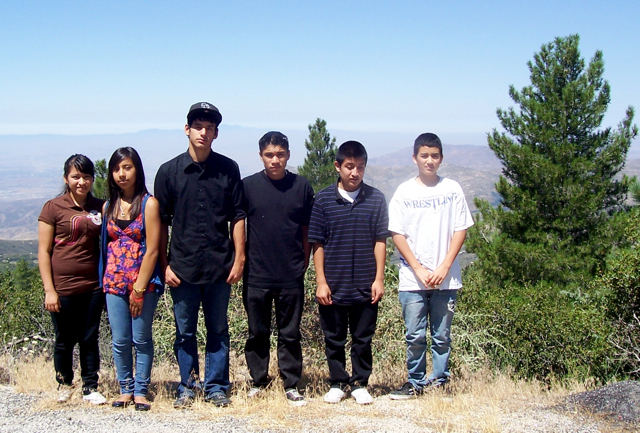 (See “Student Dance Choreography,” post from May 11, 2010). Jacob simply cut the short dresses in strips and pulled and worked with the material. “It’s all about the material. The cuts needed to move freely when the girls were dancing,” he said. The most notable part of the costumes was the “straight jacket effect,” in which the dancers arms were confined. However, it’s a giant leap from dancer’s costumes to MacBeth, but Jacob is ready for the challenge. 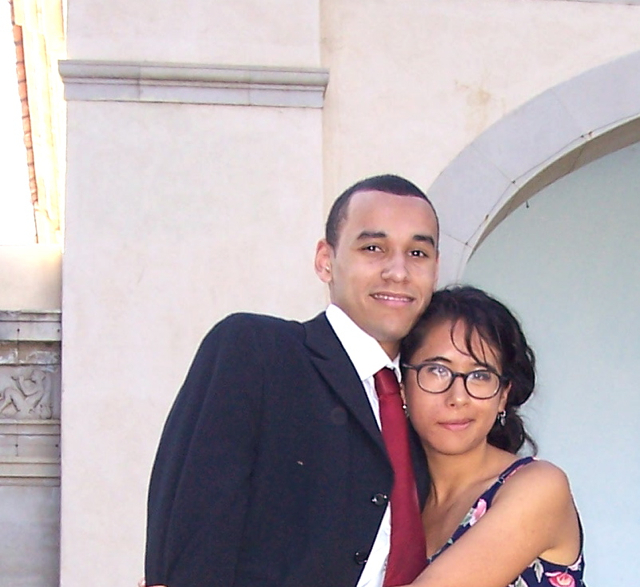 He also was happy to see his other classmates around campus, including Andie, Christine, Haley, Dakota, Kitty, Karina and Dom, among others. Some were visiting, while others were working summer jobs at the cafeteria or in the offices. Yet, most of them were taking summer classes. 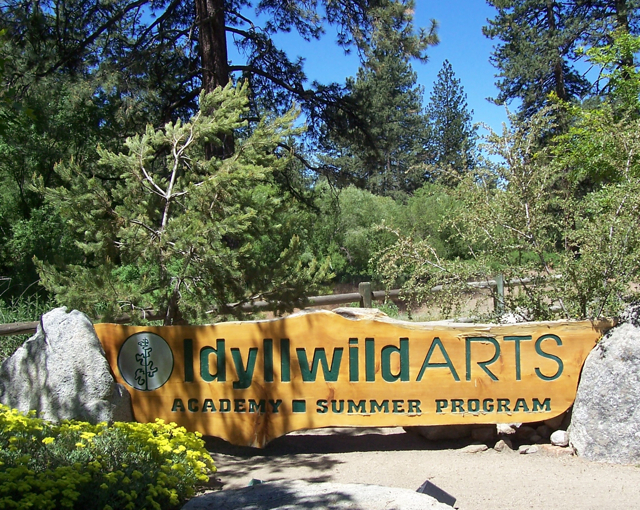 According to the “Pay Once, Learn Twice” brochure available in the Bowman main office, Idyllwild Arts students who attend this Summer Program, will receive 100 percent reduction of their summer tuition from their academic tuition. 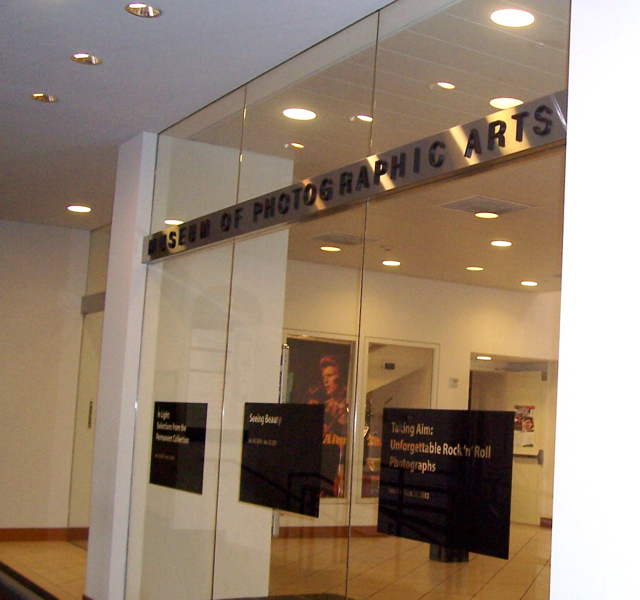 However, it’s only available to IA students who apply to the summer program and are accepted. Christine, a theater major who graduated in June, is a perfect example. 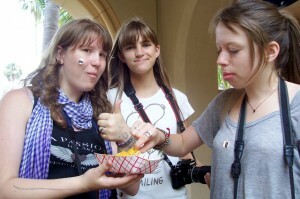 She attended the Idylwild Arts Summer Program for three years, before she spent her senior year at Idylwild Arts Academy. Last year, she said, she received a tuition reduction. Andie, who is taking “Song and Dance,” a two-week musical theater workshop, hopes to improve her vocal and dance skills this summer. She will be a junior Theater major in the fall. 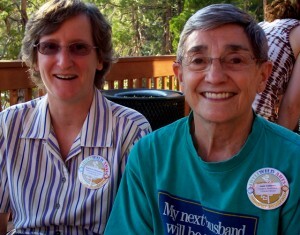 She said she’ll ask Howard Shangraw, head of the Theater Department at Idyllwild Arts, to attend her final performance. Diane said that Lina, another Theater student, is enrolled in “Theater Adventures,” a two-week class that begins July 25. There, students will act, dance, improvise and perform a short play. 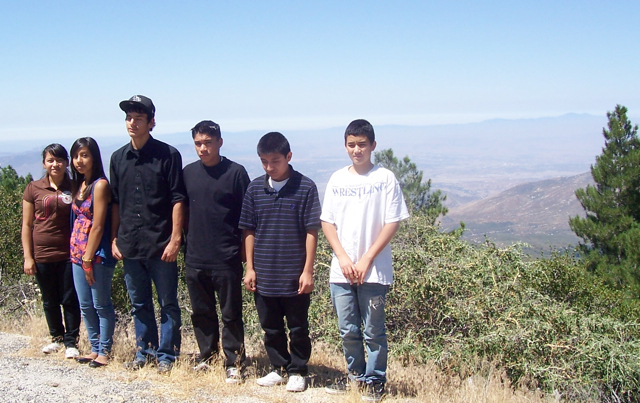 For these Idyllwild Arts students, Summer Program classes can improve their skills, and “break up the monotomy” of a long summer. Since she’s already graduated, tuition reduction is not applicable. But Kitty is happy to be back on campus. Her plans to travel and perform in Poland were sidelined because of the economic downturn. 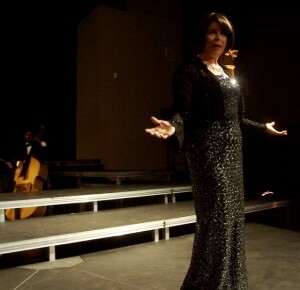 Kitty, who has won many musical awards and contests, will likely perform for music students during the summer. Jacob is going to be a teacher’s assistant for three weeks. Look for his handiwork in the upcoming play, “MacBeth,” that will be held at 8 p.m. on Friday and Saturday, July 30-31 at the JPT. 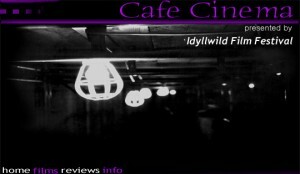 For more information, visit the Idyllwild Arts web site at www.idyllwildarts.org, and click on “Summer.” And for more information on the “Pay Once, Learn Twice Program,” contact Tara Sechrest at (951) 659-2171, ext. 2345.